Cities are lively and dynamic places often accompanied by levels of unwanted sounds (noise), which might contribute to feelings of discomfort or annoyance in many urban areas. The absence of noise (unwanted sounds) and the presence of pleasant sounds (wanted sounds) can contribute to the experience of tranquility or rest and "quietness." This experience can be found at several locations in urban areas: For example, at home, in a park, or at the square. However, due to the rapid and continuing urbanization, the spatial variation between wanted and unwanted sounds is increasingly decreasing and might at some locations even disappear. Consequently, the characteristics of (spaces within) urban areas where people can temporarily withdraw from urban stressors such as noise may change or become increasingly scarce. This is problematic, since scientific evidence indicates that spending time in areas with relatively few and low levels of stressors such as noise is beneficial for our health and well-being by offering psychophysiological recovery (also indicated as restoration) from stress and mental fatigue. Evidence is, however, still limited, and the mechanisms behind it need further attention. An important cause is that most studies address the restorative effects of naturally recreational areas outside the urban environment. Moreover, hardly any research has been carried out into the characteristics of pleasant urban sound climates (or areas with good sound quality) and its assumed positive impact on health and well-being. Conventional noise research has been focused exclusively on the negative aspects and meanings of sound, such as annoyance, ,, increase of the risk of cardiovascular disease ,,, or other impairments in health and well-being. However, in order to understand the driving forces behind noise, it is important to study the positive aspects of sounds as well. Illustrating is the fact that people like to visit discos because they appreciate the loud music , or that they like motorcycles because of the sound they make (sound design). Through its emphasis on context and meaning, the soundscape approach could potentially link with health through the restorative function of people's experiences of areas of good sound quality. Although it is assumed that areas with good sound quality are not only characterized by acoustical aspects, but also by social, spatial, and physical aspects other than sounds, an overview of what these factors are and how they are interrelated is lacking. A set of validated indicators that can be generally applied is also not available yet. Consequently, it is not possible yet to make a link between spending time in urban areas with good sound quality and its effects on human health and well-being. To explore at what scale level (city-level, neighborhood level, street level) this spatial variation may play a role. What are acoustic indicators are characterizing pleasant urban sound quality can be derived from the literature? How are these aspects linked with sound qualities? The results of this overview were used to develop a study design to investigate the research questions within TASTE. Studies in which classifications of sounds and soundscapes were derived. One of the starting points for our bibliographic search, was an earlier RIVM review dealing with the societal meaning of sound. In addition, we carried out a database query in the spring of 2011. 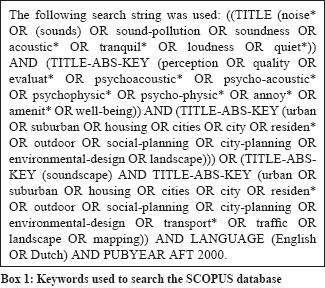 Articles involving acoustic environments in relation to health and well-being, published between 2000 and 2010 in English or Dutch, were identified in the SCOPUS database (see http://www.scopus.com). In 2013, we updated our search with articles published between 2010 and 2013. [Box 1] provides the keywords used in the search strategy. To ensure that most of the studies could be identified we manually scanned scientific journals, reports and proceeding in the area of noise, health, acoustics and soundscapes, and we checked relevant literature for additional studies. Furthermore, we consulted two environmental psychologists and a physical planner. Their comments resulted in an extension of our list with publications covering topics such as "general models of the way in which people deal with environmental stressors", and "place attachment and place identity." We evaluated the identified studies with a particular focus on mechanisms and approaches rather than the study features such as study design, sample, and sample size. The role of socio (demographic) and personal aspects. At the end of each section, we describe the implications for the study protocol that will be applied in the TASTE project. An overview of the key-elements of this study protocol is presented in [Figure 1]. As expected, the literature was primarily focused on acoustic indicators, and revealed a large variety of those, ranging from simple, verbal indicators expressing characteristics of the sounds heard (e.g., sound categories and sound quality judgments) to more complex indicators such as yearly averaged equivalent noise levels (LAeq,T ), background levels (LA90 ), and measures expressing the spectral variance of sounds. It is not clear yet, which acoustic indicator(s) predict people's perception of the sound quality of the area best: According to several soundscape studies, carried out in (city) parks and/or rural areas, ,, statistical indicators such as LA50 and LA95 may be better able to predict whether people perceive an area as "quiet" (one aspect of sound quality) than conventional indicators Lden or LA10 . In recent times, however, Brambilla et al., tested which acoustic indicators (including LA10 , LA50 , and LA95 ) could predict whether people perceive the soundscape of the area as (very) good. It appeared that all tested indicators were not highly correlated with good quality (r ~ −0.4) and that it was not possible to indicate which of the tested indicators, predicted peoples' perception best. It is not clear yet, which acoustic indicators are most suitable to characterize urban areas with good sound quality. Another relevant finding, is that although people can be quite tolerant towards noise during daily activities, sound levels should not be too high, nor should they be too intrusive. ,,,,, Illustrative, is the finding of Nilsson and Berglund among visitors of Swedish city parks, that the sound quality of these parks with an LAeq higher than 50 dB was perceived as a place with poor sound quality. Participants in a study by Brambilla and Maffei, in Italian city parks, indicated that these sound levels matched a good sound quality. In addition, according to Zhang and Kang, people will be annoyed due to high-noise levels (sound pressure level [SPL] >65-70 dB(A)), irrespective of the source. In the case, the overall noise levels are less high (SPL <65-70 dB(A)), the design of the different sounds becomes more of importance. As a possible solution, Zhang and Kang suggested that in some cases high levels of unwanted sounds can be masked by wanted sounds (auditory masking). For instance, the use of fountain sounds for masking road traffic noise in urban parks. The idea is that the sound from the fountain reduces the loudness of the road traffic noise. But as Brown states, it is not that simple: "Human preference and outcomes depend less on the absolute levels of sounds and more on the nature of the sounds that are presents (and in particular on the appropriateness of the particular sounds in a particular place and context - wanted and unwanted sounds), and on the relative levels of those sounds". Therefore, it will not be a surprise that consensus about when unwanted sound levels are too high, and are a threat for the pleasantness of the sound quality in an urban area, is still lacking. When characterizing urban areas with good sound quality, a broader view is needed: For a pleasant sound quality, the balance between unwanted and wanted sounds is important. 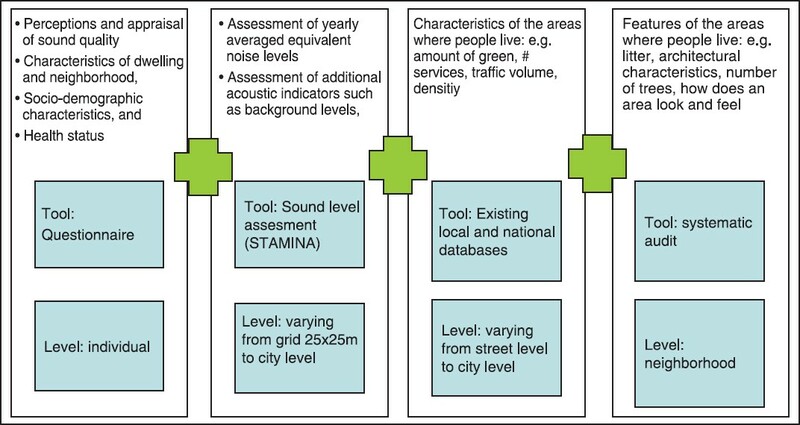 Although consensus about what set of acoustical indicators is most suitable to characterize urban areas with good sound quality, is still lacking, it is clear that acoustic indicators such as background levels (LA50 , LA90 , and LA95 ), other than the conventional LAeqT metrics, could also be of importance. However, with most sound models, it is only possible to estimate sound levels from sources that produce noise. These are usually expressed as yearly equivalent sound levels (Lden and Lnight ). Unfortunately, it is not possible yet to model and/or estimate sound levels of wanted sounds. In order to obtain a clear picture of the levels of wanted sounds and their variation in time and space, costly sound measurements are required, which is not always feasible. The interquartile ranges of all 24-h equivalent SPLs (expressed as Lden ) in the street or neighborhood where the participants' dwelling is situated. In this way, we hope to get more insight into the spatial distribution of sound levels from dominant noise sources in the urban context. The results from our review demonstrate that it is important that, in addition to information people's perceptions, also information on several physical and social features of the neighborhood where the participants live, should be collected. Within TASTE, this will be done by trained surveyors who register the features of the selected neighborhoods in a systematic way (auditing). In this way, information about the neighborhoods can be collected that cannot be derived from secondary data or registrations, such as the architectural character, maintenance of the landscape, and the general impression of the place ("how a place looks and feels like"). Data thus gathered can in a later phase of the project be combined with data from national and local databases (usual in geographic information systems) such as the type, age of the buildings in the neighborhood, urbanization level, land use, air pollution levels. In addition, information regarding the level of amenities (e.g., number of and distance to shops, bars and restaurants, places to meet, health care services) will be gathered [Figure 1]. An alternative way to explore in more detail the spatial and temporal variation in soundscapes (including wanted sounds) present within an urban area and their perception by its inhabitants, is a smartphone-based monitor of time location patterns. , By adding momentary states (ecological momentary assessment), it would be possible to find out more about their potential of offering recovery from stress and fatigue. Unfortunately, it will not be feasible to apply a smartphone-based monitor in TASTE. The results of the review imply that information about sociodemographic factors should be derived. Within TASTE, this will be done in two ways: Information will be gathered from national and local databases (e.g., age and gender distribution, number of beneficiaries, ethnicity). In addition, inquiries for conventional sociodemographic factors at individual level will be included in the questionnaire as well as aspects such as length of residency, place attachment, and social cohesion and other aspects relevant for the evaluation of sounds and sound quality (e.g., noise sensitivity and coping). This paper summarizes the literature of acoustical, social, physical and spatial aspects other than sound that might be relevant for the characterization of urban areas with good sound quality. To this end, not only literature from conventional research was evaluated; also, literature from the so-called soundscape field was included. Although a general set of validated indicators that can be directly applied, is not available yet, a set of indicators was derived from the literature. These form the basis of a study protocol that will be applied in TASTE, a project that aims to describe sound qualities at a low-scale level. Key-elements of this study protocol, including a questionnaire and the systematic audit of neighborhoods, were presented in this paper. Bento Coelho JL, Chourmouziadou K, Axelsson Ő, Boubezari M. Soundscape of european cities and landscapes. Creating and designing Soundscape of european cities and landscapes COST TD0804 Final Conference Merano, Italy; 2013. Booi H, Bosveld W. Stille Gebieden in de Stad. Amsterdam: Gemeente Amsterdam, Dienst Onderzoek en Statistiek; 2008. Health Council of The Netherlands. Quiet areas and health. The Hague: Health Council of The Netherlands; 2006.
van Kamp I, Babisch W, Brown AL. Environmental noise and health. In: Friis RH, editor. The Praeger Handbook of Environmental Health. 1. Santa Barbara, California: ABC-CLIO, LLC; 2012. p. 69-94. Brown AL. Soundscapes and environmental noise management. Noise Control Eng J 2010;58:493-500. Payne SR, Davies WJ, Adams MD. Research into the practical and policy applications of soundscape concepts and techniques in urban areas. London: Welsh Assembly Government, Department of the Environment, The Scottish Government, Department for Environment, Food and Rural Affairs; 2009. World Health Organisation. Guidelines for Community Noise. Geneva, Switzerland: World Health Organisation; 2000. World Health Organisation. Night Noise Guidelines for Europe. Copenhagen: WHO Regional Office for Europe; 2009. Babisch W. Transportation Noise and Cardiovascular Risk. Review and Synthesis of Epidemiological Studies. Dose-effect Curve and Risk Estimation. Berlin: Umweltbundesambt; 2006.
van Kempen E, Babisch W. The quantitative relationship between road traffic noise and hypertension: A meta-analysis. J Hypertens 2012;30:1075-86. Neyen S. Acceptance concerning sound level limits with pupils in the age between 10 and 19 years. Z Larmbekampf 2003;50:54-62. Weichbold V, Zorowka P. Will adolescents visit discotheque less often if sound levels of music are decreased?. HNO 2005;53: 845-8, 850. Devilee J, Maris E, van Kamp I. The societal meaning of sound and noise. Bilthoven: RIVM; 2010. Botteldooren D, Decloedt S, Bruyneel J, Pottie S. Characterisation of quiet areas: Subjective evaluation and sound level indices. Forum Acusticum; March 1999; Berlin, Germany; 1999. Yang W, Kang J. Acoustic comfort evaluation in urban open public spaces. Appl Acoust 2005;66:211-29. De Coensel B, Botteldooren D. The quiet rural soundscape and how to characterize it. Acta Acust United Acust 2006;92:887-97. Brambilla G, Gallo V, Zambon G. The soundscape quality in some urban parks in Milan, Italy. Int J Environ Res Public Health 2013;10: 2348-69. Brambilla G, Maffei L. Responses to noise in urban parks and in rural quiet areas. Acta Acust United Acust 2006;92:881-6. Zhang M, Kang J. Towards the evaluation, description, and creation of soundscapes in urban open spaces. Environ Plann B 2007;34:68-86. Nilsson ME, Berglund B. Soundscape quality in suburban green areas and city parks. Acta Acust United Acust 2006;92:903-11. Gidlöf-Gunnarsson A, Öhrström E. Noise and well-being in urban residential environments: The potential role of perceived availability to nearby green areas. Landscape Urban Plan 2007;83:115-26. Gidlöf-Gunnarsson A, Ohrström E. Attractive "quiet" courtyards: A potential modifier of urban residents' responses to road traffic noise? Int J Environ Res Public Health 2010;7:3359-75. Brown AL. The sounds people might hear in a place? Describing sources in the acoustic environemnt, and their role in the perception of soundscape. COST TD0804 Final Conference; Merano, Italy; 2013. Klaeboe R, Engelien E, Steinnes M. Context sensitive noise impact mapping. Appl Acoust 2006;67:620-42. Klaeboe R, Kolbenstvedt M, Fyhri A, Solber S. The impact of an adverse neighbourhood soundscape on road traffic noise annoyance. Acta Acust United Acust 2005;91:1039-50. ISO. Acoustics - Assessment of Noise Annoyance by Means of Social and Socio-Acoustic Surveys. Geneva, Switzerland: ISO; 2003. Booi H, van den Berg F. Quiet areas and the need for quietness in Amsterdam. Int J Environ Res Public Health 2012;9:1030-50. Schreurs EM, Jabben J, Verheijen EN. STAMINA Model Description. Standard Model Instrumentation for Noise Assessments. Bilthoven: RIVM; 2011. Schreurs E, Jabben J, Bergmans B, Koeman T. Background noise: An increasing environmental problem? Acta Acust United Acust 2010;96:1125-33. Kang J. Sound propagation in interconnected urban streets: A parametric study. Environ Plann B 2001;28:281-94. Salomons EM, Polinder H, Lohman WJ, Zhou H, Borst HC, Miedema HM. Engineering modeling of traffic noise in shielded areas in cities. J Acoust Soc Am 2009;126:2340-9.
van Renterghem T, Hornikx M, Forssen J, Botteldooren D. The potential of building envelope greening to achieve quietness. Build Environ 2013;61:34-44. Samara T, Tsitsoni T. Road traffic noise reduction by vegetation in the city ring road of a big city. In: Kungolos A, Aravossis K, Karagiannidis A, Samaras P, editors. Proceedings of the International Conference on Environmental Management, Engineering, Planning and Economics; June 24-28 2007; Skiathos 2007. p. 2591-6. Fang CF, Ling DL. Guidance for noise reduction provided by tree belts. Landsc Urban Plan 2005;71:29-34. Fang CF, Ling DL. Investigation of the noise reduction provided by tree belts. Landsc Urban Plan 2003;63:187-95. Fan Y, Zhiyi B, Zhujun Z, Jiani L. The investigation of noise attenuation by plants and the corresponding noise-reducing spectrum. J Environ Health 2010;72:8-15. Aylor DE. Noise reduction by vegetation and ground. J Acoust Soc Am 1972;51:197-205. Ge J, Lu J, Morotomi K, Hokao K. Developing soundscapegraphy for the notation of urban soundscape: Its concept, method, analysis and application. Acta Acust United Acust 2009;95:65-75. Ge J, Hokao K. Applying the methods of image evaluation and spatial analysis to study the sound environment of urban street areas. J Environ Psychol 2005;25:455-66. Southworth M. The sonic environment of cities. Environ Behav 1969;1:49-70. Anderson LM, Mulligan BE, Goodman LS, Regen HZ. Effects of sounds on preferences for outdoor settings. Environ Behav 1983;15:539-66. Carles JL, Bernaldez FG, De Lucio JV. Audiovisual interactions and the soundscape preferences. Landsc Res 1992;17:52-6. Tamura A. Effect of landscaping on the feeling of annoyance of a space. In: Schick A, Klatte M (Eds.) Contributions to psychological acoustics: Results of the Seventh Oldenburg Symposium on Psychological Acoustics. Oldenburg: Bibliotheks- und Information's system der Universität Oldenburg; 1997. p. 135-61. Viollon S, Lavandier C, Drake C. Influence of visual setting on sound ratings in an urban environment. Appl Acoust 2002;63:493-511. Rohrmann B, Bishop I. Subjective responses to computer simulations of urban environments. J Environ Psychol 2002;22:319-31. Pedersen E, Larsman P. The impact of visual factors on noise annoyance among people living in the vicinity of wind turbines. J Environ Psychol 2008;28:379-89. Pheasant RJ, Watts GR, Horoshenkov KV. Validation of a tranquility rating prediction tool. Acta Acust United Acust 2009;95:1024-31. Pheasant RJ, Fisher MN, Watts GR, Whitaker DJ, Horoshenkov KV. The importance of auditory-visual interaction in the construction of 'tranquil space'. J Environ Psychol 2010;30:501-9. Lindal PJ, Hartig T. Architectural variation, building height, and the restorative quality of urban residential streetscapes. J Environ Psychol 2013;33:26-36. Hildalgo M, Beto R, Galindo MP, Getrevi A. Identifying attractive and unattractive urban places: Categories, restorativeness and aesthetic attributes. Medio Ambiente Y Comport Hum 2006;7:115-33. Stamps AE. Visual permeability, locomotive permeability, safety and enclosure. Environ Behav 2005;37:587-619. Stamps AE. Architectural detail, van der Laan septaves and pixel counts. Des Stud 1999;20:83-97. Stamps AE. Physical determinants of preferences for residential facades. Environ Behav 1999;31:723-51.
van den Berg AE, Hartig T, Staats H. Preference for nature in urbanized societies: Stress, restoration, and the pursuit of sustainability. J Soc Issues 2007;63:79-96. Korpela K, Hartig T. Restorative qualities of favorite places. J Environ Psychol 1996;16:221-33. Bolger N, Davis A, Rafaeli E. Diary methods: Capturing life as it is lived. Annu Rev Psychol 2003;54:579-616. Burton C, Weller D, Sharpe M. Are electronic diaries useful for symptoms research? A systematic review. J Psychosom Res 2007;62:553-61. Korpela K, Ylen M, Tyrvainen L, Silvennoinen H. Stability of self-reported favourite places and place attachement over a 10-month period. J Environ Psychol 2009;29:95-100. Korpela K, Hartig T, Kaiser F, Fuhrer U. Restorative experience and self-regulation in favorite places. Environ Behav 2001;33:572-89. Kang J, Yang W, Zhang W. Soundscape and acoustic comfort in urban open public spaces. 19 th Annual meeting of the international society of for psychophysics Cyprus: International Society for Psychophysics; 2003. Schulte-Fortkamp B, Nitsch W. On soundscapes and their meaning regarding noise annoyance measures. The 1999 International Congress on Noise Control Engineering; Fort Lauderdale: International Institute of Noise Control Engineering; 1999.